Israeli soldiers abducted, Friday, three Palestinian children near the northern entrance of the West Bank city of Bethlehem, and injured many others near Nablus, in the occupied West Bank. The soldiers also attacked protesters in Kufur Qaddoum. Media sources in Bethlehem said the soldiers resorted to the excessive use of force against Palestinian protesters at the northern entrance of the city, before chasing them, and abducted three children. The three abducted children, who remained unidentified at the time of this report, were attacked by the soldiers who took them to an unknown destination. The Palestinian Red Crescent Society in Bethlehem said the soldiers shot the Palestinian in the chest, before he was rushed to a medical center. The soldiers also fired many gas bombs and concussion grenades at the protesters. In addition, the soldiers shot one Palestinian with a rubber-coated steel bullet and caused at least five others to suffer the effects of teargas inhalation, in Beita and Kafr Qalil villages, south of the northern West Bank city of Nablus. 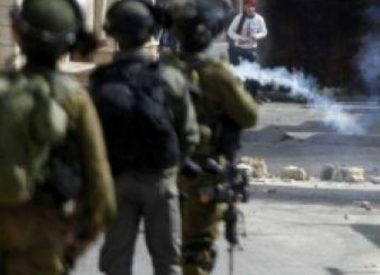 In Qalqilia, in northern West Bank, the soldiers attacked the weekly nonviolent procession against the Annexation Wall and colonies in Kufur Qaddoum town, east of the city, and fired many gas bombs and concussion grenades at the protesters. The soldiers also installed a military roadblock at a bypass road leading to the village, especially since its main road has been completely blockaded since more than fourteen years to enable easy access to colonialist settlers, driving two and from the illegal Kedumim colon, which was built on private Palestinian lands. In addition, the army invaded and ransacked homes, and used their rooftops as monitoring towers and firing posts.